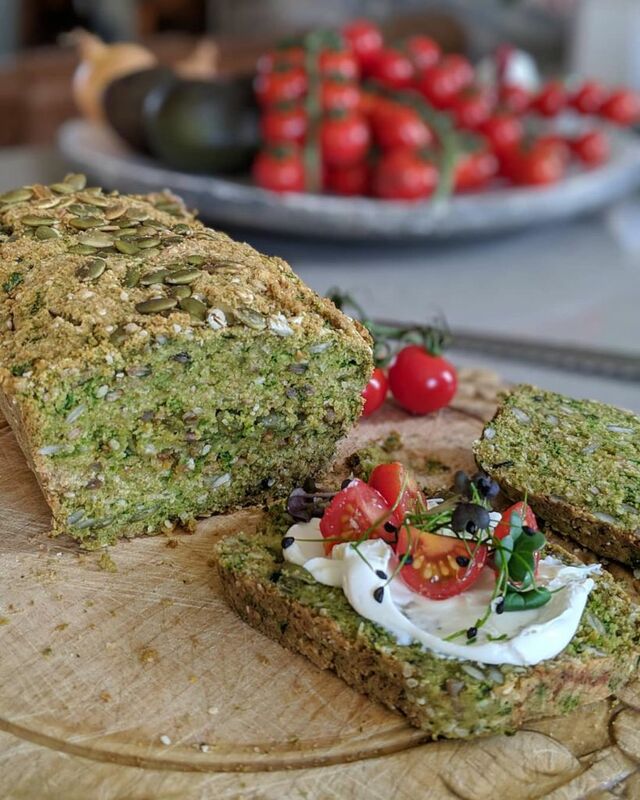 Bread isn’t one of my usual weakness and I don’t normally eat very much of it, but when a girlfriend gave me some of her ‘paleo bread’ the other day I became utterly hooked. Deliciously moist it will keep for 5 days in the fridge (though with constant nibbling it doesn’t last nearly that long!). It also freezes really well so I often make double the quantities and freeze one. A great thing about this recipe is that you can play with it by adding different nuts, seeds and even vegetables. If I want it to be ‘greener’ I add more spinach but you can also add grated carrot or beetroot if you fancy. Mix the dry ingredients together. Preheat the oven to 160C for fan or 180C non fan. Beat the eggs till frothy then add the oil and vinegar and greens. Stir into the dry ingredients. Pour the batter into a 1lb tin lined with baking parchment (or can be well oiled if you prefer). Lightly grease with oil and scatter over a few more seeds. Bake for about 40 minutes till cooked (check by inserting a sewer into the middle and if it comes out clean it is done). Leave to cool on a rack before wrapping it in foil till needed. (do not use clingfilm as it may become soggy).